I didn't plan to try Goodness Cakes Bakery until Thursday, but I was right in the neighborhood the other day when I took Nick to get his hair cut. We decided to stop in. I really haven't heard much about the cupcakes at Goodness Cakes, but I have heard from others about how delicious their wedding cakes are. I can see why. 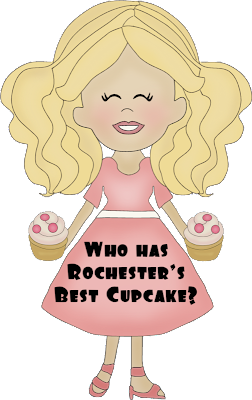 Goodness Cakes is located on University Avenue in Rochester near Writers & Books and Craft Company No. 6. We walked inside this bright and cheerful little place and spotted some minis--mini eclairs, mini cupcakes, and more. You could buy one for 80 cents or choose 4 for $3.00. We brought home the 2 cupcake varieties they had and 2 mini eclairs for dessert Saturday. The cupcakes they had available were Vanilla Bean (pictured on the right) and Irish Cream (the left). I only had a chance to try the frosting on the Irish Cream, as Nick grabbed the rest as I was attempting to photograph the inside. For reference, I am reviewing the Vanilla Bean. As you can see, it is a beautiful mini cupcake. Vanilla Bean isn't a flavor I would normally go for. I like more elaborate, filled varieties with broken up candies and things on top. I honestly didn't think I would love it, but love it I did. First of all, the texture of the cake is fantastic. I would classify this as perfect. Moist? Yes. Too moist bordering on uncooked or wet (and I experienced one of those already)? Not at all. While these are unfilled and much more traditional, they really are the perfect texture for a cake. The flavor of the cake was also lovely. I liked that I could detect a true vanilla bean flavor. That can be hard to achieve and you can tell that a very goof quality vanilla was used in this cupcake. Again, as a more simple cupcake, I cannot say that this was perfect--it was darn near close, though. The flavor of the frosting is what really stood out to this cupcake lover. It was creamy and fluffy at the same time and, again, had a beautiful flavor throughout. it was sweet without being overly sweet and really was just a true delight. These gorgeous cupcakes really tasted fantastic. If you are looking for a traditional cupcake, I would definitely recommend Goodness Cakes. The vanilla bean cupcake here was really wonderful and would be a great choice for a birthday party, shower, or just to settle that craving. As for Goodness Cakes itself, the service is super friendly (as it has been at all of my stops thus far) and the case full of goodies left me wanting to go back to try other things the next time I am in the Neighborhood of the Arts. Goodness Cakes can be found at 720 University Avenue. OK, my friends, we have one more stop and reviewing will be complete. My friend, Christine, and I are headed out one evening this week to Sugar Mountain Bake Shoppe. After that, I'll announce the winner! I also want to say that taste is something very subjective. Just because I adore a certain cupcake doesn't mean you will agree with 100% of my review. The opposite will also be true. With those things said, enjoy the reviews as they come and look for a winner at the end of next week.